So, our mighty Red Bulls needed a to win their final home match of the season to have any hope of avoiding a play-in game or, at the very least, playing said play-in game at home. 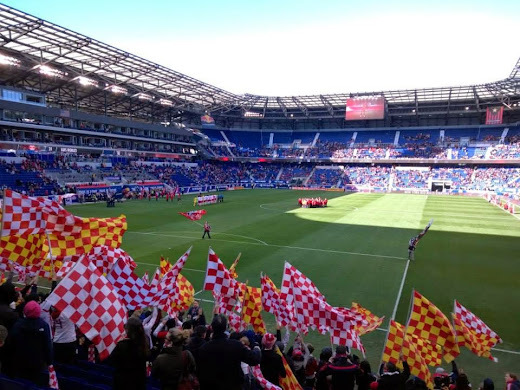 Unfortunately for us, our mighty Red Bulls weren't so mighty this past Sunday and allowed the visitors from OH to boss them around the RBA pitch to no end (A Crew player I've never even heard of scored not one, but two goals after only scoring one in his previous 14 MLS appearances). This result virtually assures our team having to play that mid-week play-in game away (either at Columbus or SKC). The main thing to contemplate is that this very well could have been Thierry Henry's last game ever @The Cathedral of Football. The Red Bulls need to win at SKC in order to come in, at the very least, in 4th place. That would mean a home play-in game for us. Also, if Columbus loses to Philadelphia, we could conceivably come in 3rd, which would mean we would be in the playoffs proper. A third or fourth place finish would mean that we could pay homage to "Le Roi" at least one more time before he sails off into the sunset. But since we're usually total crap away, I can't see us winning at SKC and I can't see us winning an away play-in game (either at SKC or Columbus). But if this was, indeed, TH14's final home game for us, it was nowhere near a proper send-off. In fact, I would deem this a "That's So Metro" type moment. In other words, just about the correct ending for us. Au Revoir Thierry! Vous êtes Le Roi ! Yeah, yeah, I know. Minor miracles do occur from time to time (and a mid-week game might mean these guys are not exhausted from Friday/Saturday night partying in NYC/Hoboken), so let us pray. Please see the video above for the usual drunken comments/predictions. You're in a for a treat, as there is another shocking Matt Conroy rant in the (almost) full-time comments. Matt's a Top Bloke and "a prescient man" as this article points out. Another Top Bloke named Matt Kremkau is a fantastic photographer. Please click here to check out his photo album from this one (you can click here for the slide show). Many thanks to the rest of the fellows who stand with me in the usual spot at the top of 133 for another season of great drunken fun. We'll do it again next year. That's it for now and it actually might be it until next season. Whatever the case, we'll see you soon enough @The Cathedral of Football, Red Bull Arena (built by Makita). The big viper is outta here!